At a ceremony in Los Angeles, the Recording Academy was keen to overcome the bad press from last year when, after a male-heavy winners list, Academy president Neil Portnow was quoted as saying female performers needed to “step up” if they wanted a better showing. 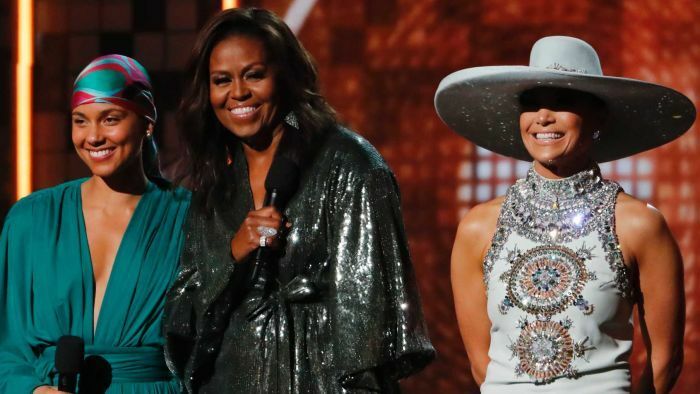 “From the Motown records I wore out on the Southside to the ‘Who Run the World’ songs that fuelled me through this last decade, music has always helped me tell my story,” the former first lady said. Mayer came back on stage with that Grammy in hand on Monday, and the pair hugged, with Mayer joking the statue was “the best joint-custody agreement in showbusiness”. It was a clear attempt by the Academy to make up for criticisms it has overlooked women — and particularly women of colour — in favour of men, and to acknowledge the outcry over Portnow’s comments last year, which came after he was asked about the lack of female winners at the 2018 Grammys. Women who want to be musicians, engineers, producers or music industry executives needed “to step up, because I think they would be welcome,” he told Variety after last year’s ceremony. Big names like Pink and Sheryl Crow were among those to criticise Portnow, who later announced he would make this year’s ceremony his last as Academy president. The Grammys, while ostensibly music’s night of nights, are viewed with scepticism by some in the industry, particularly those working in hip hop, which is the biggest genre in popular music but has historically been overlooked in the main categories. He did appear this year, accepting the award for Best Rap Song for God’s Plan — which does feature him rapping. However, he didn’t get to finish his acceptance speech. “I guess this year we have really stepped up,” Lipa said, in a direct reference to last’s year controversy. Sydney producer Fisher, whose song Losing It came in at number two in this year’s Hottest 100, lost in the Best Dance Recording category to Electricity by Silk City and Dua Lipa feat. Diplo and Mark Ronson. However, Paul Mabury, an Australian songwriter and producer based in Nashville, won in the Best Contemporary Christian Music Performance/Song category for his work on Lauren Daigle’s You Say.